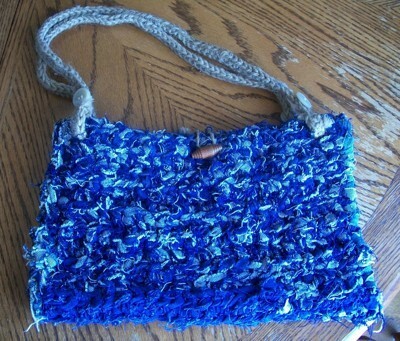 A fun craft project is to crochet a purse. This guide is about making a crochet bag. 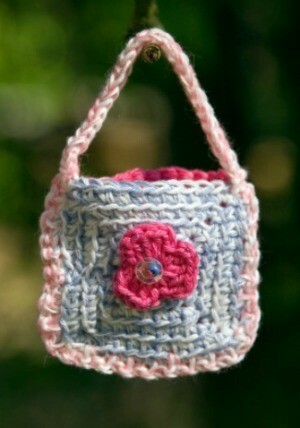 I am looking for a free crochet pattern for a Walker Bag/Pocket. I found one, but its made of plastic, I want to make it with yarn, thanks. This is a very easy project to make. The first thing I want to caution you on is NOT to use regular yarn! It stretches all out of shape and where you made one that is maybe 20 inches from your shoulder down, it'll wind up down by your knees from stretching! Plus it's a lot hotter to carry in the summer time. Get some cotton yarn to meke this out of and you'll be a lot happier with it. If you'll contact me I'll be happy to send the pattern I made up for mine. The pattern is adjustable to whatever size you want it to be. Jean, here's the pattern I promised! Hope it works for you. Row 1: Ch 46. Sc in 2nd ch from hook and in each ch across. Ch 1, turn. (45 sc) (You can adjust the width by increasing or decreasing the number of stitches across. Rep Row 2 till the length you want the bag to be. Fasten off after last row. Whip stitch the 2 sides together on 3 sides, leaving the top open. Row 1: Ch 11 (or as many as you want the width of the strap to be, plus 1). Row 2: Sc in back loops only of each sc across. Ch 1, turn. Rep Row 2 till the length you want the strap to be. Fasten off after last row. Sl st strap to each side of the bag. I sl st-d across 2 times on each side to make sure it was extra secure. *Using sewing thread, slip stitch a heavy duty zipper in place. *Using sewing thread, slip stitch a strip of Velcro on either side. When making the sides, I made one side longer than the other. That way I could fold it over as a flap. Then you could either leave it like this, or you could sew on a button on the short side, then create a button hole on the long side using ch st.
To make it so it doesn't swing so much on a walker you could simply tie the bottom 2 corners to the legs using whatever you wanted to use--matching yarn, shoe laces, string, etc. Thanks so much for posting that pattern. It's much appreciated. Here is a free pattern for my walker/wheelchair bag I crocheted. 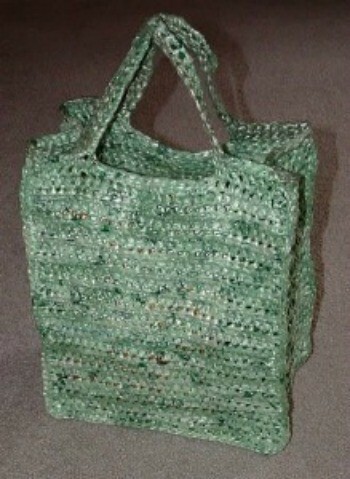 I also have an option for using recycled plastic bags to make one but this one is crocheted with regular yarn. 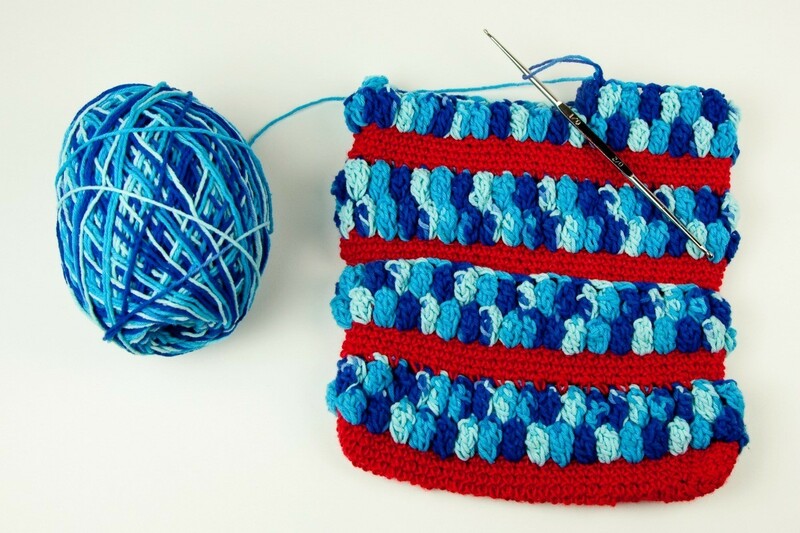 This is a guide about making a crocheted t-shirt clutch bag. Old, worn out t-shirts can always find a new life in your crochet craft projects. This is a guide about making a crossbody crochet purse. 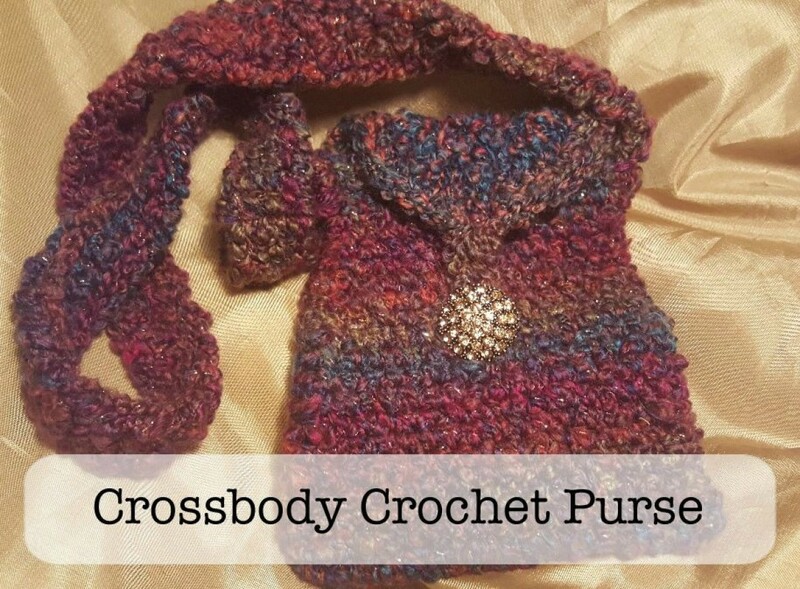 If you like the crossbody purse style and can crochet, this may be the perfect project for you. This is a guide about making a plarn bag. Plarn, made from plastic bags, is a marvelous substitute for traditional yarn for crafting. This cute little St. Patrick's Day inspired bag is fun to make and use. 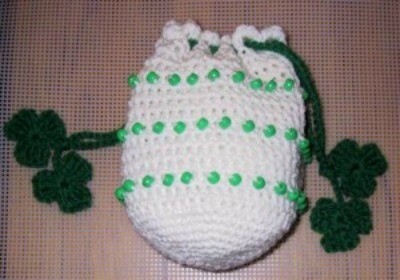 This is a guide about making a crochet beaded shamrock bag. This is a guide about making a crochet beaded Valentine bag. 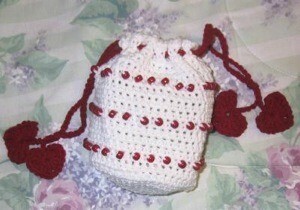 This pretty crochet bag uses Valentine's Day colors and embellishments. 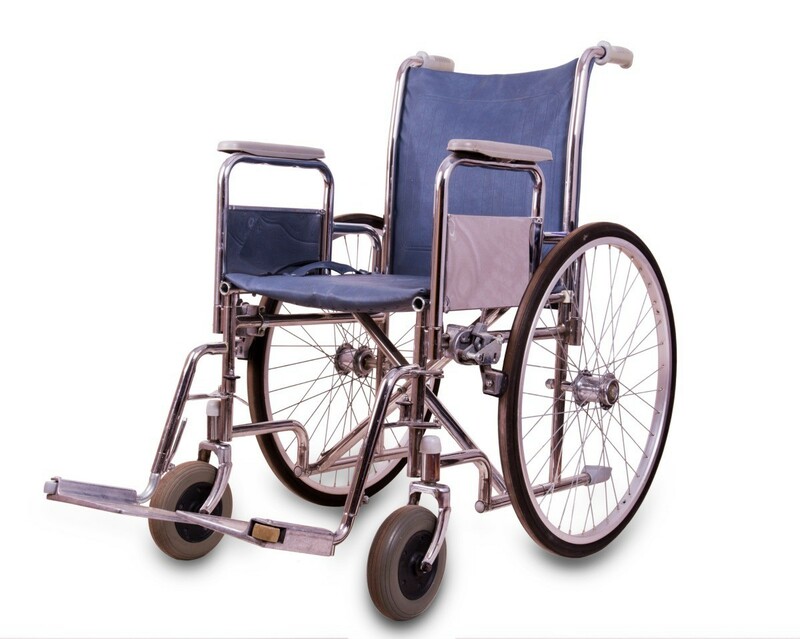 This is a guide about making a crochet wheelchair bag. Having a convenient bag to carry your personal items is very helpful for someone using a wheelchair. This is a guide about crocheted purse ideas. 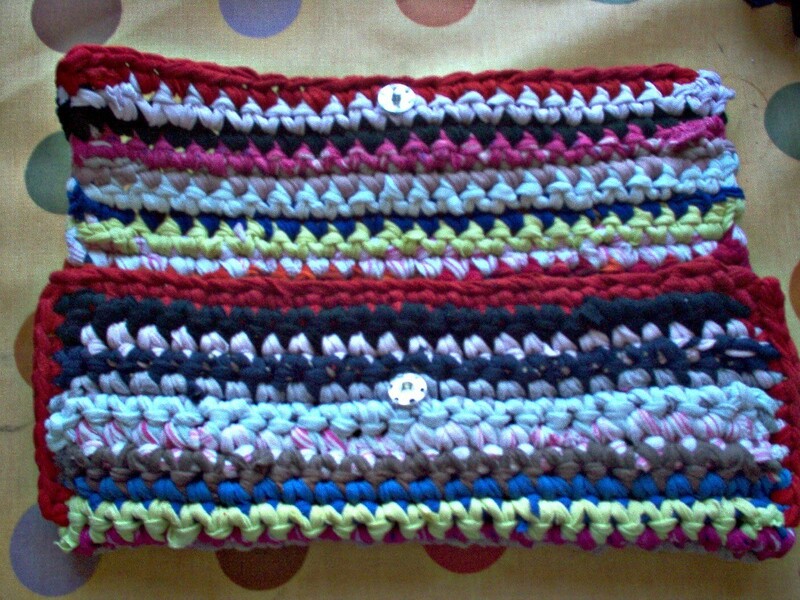 Making a crochet purse is not only fun, but you will have a useful, one of a kind, item for yourself or to give as a gift.